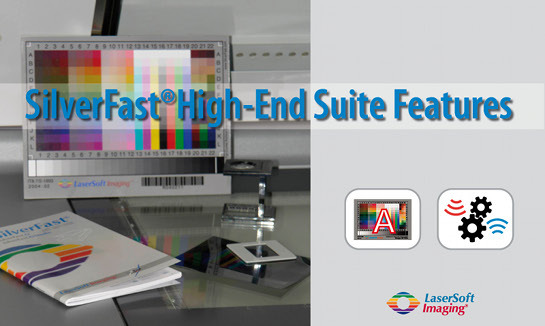 Award-winning SilverFast from LaserSoft Imaging is now available for Heidelberg CHROMAGRAPH 3300/3400, TOPAZ, TANGO/XL, NEXSCAN and PRIMESCAN scanners on Windows (2000, XP, Vista and Windows 7) and Macintosh OS-X (10.3 - 10.6). "Der SPIEGEL", Europe's leading news magazine published in Hamburg, uses the combination of SilverFast Ai Studio and SilverFast HDR Studio to drive its high-end scanner, Heidelberg Nexscan. Note: If you have a prior version and wish to upgrade to the actual High-End Suite please call our customer support by phone (+49 (0)431-56009-0) or write an email to: order@silverfast.com. Ultimate compatibilty for scanners is ensured when using hardware and firmware revisions which work with LinoColor 6 or NewColor 2.0. To test compatibility please install our free demo version. We recommend testing with the targeted hardware. SilverFast Ai STUDIO for Heidelberg CHROMAGRAPH, TOPAZ, TANGO, NEXSCAN and PRIMESCAN scanners is able to write TIFF files with the full dynamic range. It is no longer necessary to convert to 24bit RGB. These files yield maximum quality and productivity for a dedicated workflow. You can use these scans like a "digital original" from your scanner and even apply a JPEG 2000 compression. SilverFast HDR STUDIO reads those RAW files and allows the user to optimize the pictures offline like originals on the scanner without any loss of quality. While the scanner is working the user can optimize pictures on another workstation in batch mode. Of course, any well known SilverFast tool is also available, e.g. NegaFix, including over 120 film profiles and the ability to quickly and easily create and customize your own. Even with JPEG 2000 compression SilverFast will work those files 7 times faster than any other imaging software. With the HiRepp function you will be able to compress without a loss in quality up to 3GB files and reopen these files again quickly. The Heidelberg CHROMAGRAPH, TOPAZ, TANGO, NEXSCAN and PRIMESCAN can be used on any OS X System up to Snow Leopard and even on an Intel Mac with an aftermarket adapter for FireWire 400. Among the various highlights you will find our IT8 calibration with color correction (up to 12 colors), Plug&Play CMYK, batch mode, JobManager and the professional multiple Densitometer. Softproof with PhotoProof and printing with layout through PrinTao are also available. So SilverFast Ai STUDIO and SilverFast HDR STUDIO become your dedicated workflow solution. "We have used SilverFast's High-End Suite for years and we are very pleased that SilverFast allows to run our Heidelberg high-end scanners with modern operating systems up to Mac OS X 10.6 or Win 7. Through combination with image processing software SilverFast HDR Studio 8, we have the ability to edit and optimize images in parallel on a second computer. This way, we achieve a maximum efficiency, namely optimum quality within short processing time." “From now on, we will operate our High-End Nexscan scanner with the SilverFast Ai Studio and HDR professional scanning software from LaserSoft Imaging AG, Kiel. Technical advice, installation and training services provided to us by LSI’s distribution partner, Systemhaus Brakensiek, Dortmund, has been a great success. Premium Support is also guaranteed by Brakensiek Systemhaus. Top German current affairs weekly magazine, Der SPIEGEL, found this investment an attractive proposition, particularly because it enables an efficient workflow, by allowing originals to be scanned with a maximum dynamic range and then be saved and archived as “digital originals.” Saving data with a depth of 48 bits allows maximum quality and productivity in the workflow. Furthermore, we trust the mature technical color management know-how of LaserSoft Imaging, including integrated IT8 calibration and extended selective color correction for up to 12 colors. SilverFast has finally allowed us to use the latest Macs with Intel processors”. "... what makes SilverFast Ai better than the average bear for scanning tasks, particularly for print and e-media production, is the truly well thought-out interface and the wealth of production-oriented features." "All in all, this (SilverFast) is a superior scanning environment with production-oriented options ... and professional results for both newcomers and scan pros. I highly recommend it"
"We recently purchased the SilverFast Ai Studio and HDR Studio Package for both of our Topaz scanners. With this new workflow, our prepress production is much more efficient. With over 1400 scans and more digital camera files coming in each month, SilverFast's PrinTao feature is a tremendous time saver. No more loading individual files into Quark for proofing. With SilverFast we can already see a substantial return on our investment." "We purchased the SilverFast scanning software package for our Heidelberg Topaz scanner so we would always have an upgrade path to newer software and hardware. With LinoColor it was pretty much a dead end on system 9. The Auto De-Screening feature in SilverFast is amazingly good and we are very happy with the quality of the scans. With regards to color control - what I see in SilverFast is very, very close to what comes off the digital press." While these scanners can be used with the traditional SCSI interface there might be a problem when using newer versions of the operating system (SCSI does not work very well on newer systems of Mac computers). Sometimes suitable SCSI cards are also hard to find (especially for the latest Macs but also for the latest PCs and for Notebooks in general), so we recommend using a Firewire-to-SCSI Adapter. Please see our supported adapters for details.